Skin lightening and whitening is a huge industry not only in the Philippines, but in all of Asia. I submit based on my experience in the Philippines, that there is a distinct correlation between skin lightening and racial tolerance. Some Filipinos are negative to any dark skinned individuals including those of their same race. Some Filipinos are accepting of darker colored people but yet still prefer to be whiter themselves. And of course there are Filipinos that embrace all colors and are comfortable in their own skin. It is not this writer’s intention to promote racial division or racial hatred. Rather, I simply want to reveal a part of the Filipino culture that is akin to the Black American culture as skin lightening is prevalent in the Black American culture as well. On a personal note as a Black American, I am very happy with my skin color as well as with my race and nationality. In addition, I accept all races and all colors as we are all children of the most high God. In order to understand the why behind skin lightening in the Philippines we have to look briefly at the historical past. The Philippines were discovered by the by Ferdinand Magellan, (a Portuguese explorer) and the islands were claimed for Spain. In 1565 Miguel Lopez de Legazpi ( a Spanish explorer) began colonization in Cebu and formed the first European settlements. 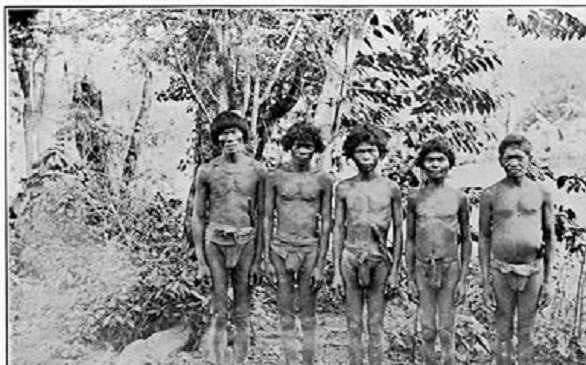 The natives found on the island were call “Negritos” meaning small and black people. So we see the first known people on the islands were dark skinned. It is through race inter-mingling with the Europeans through four hundred years that the skin color of the people changed to a lighter hue. Negrito Tribesmen – Many believe that the Negritos migrated from Africa to the Philippines.